Intelligence For Your Life - Stop Talking To Your Dog! Stop Talking To Your Dog! She may understand you better if you stop talking with your mouth and use body language instead. While it’s true that dogs can learn some words - English isn't their first language. Body language is… and dogs have evolved to be excellent readers of it - including facial expressions. That’s how dogs know what we’re thinking or feeling. But often, when we give verbal commands and hand signals at the same time, dogs read it as a mixed message. Like, if you’ve ever told your dog to stay and put your hand up like a crossing guard, telling people to stop. A dog reads that body language as an invitation to move toward you. So animal behaviorists recommend this experiment: Try to spend a whole day not saying a word to your dog, only communicating with your body. 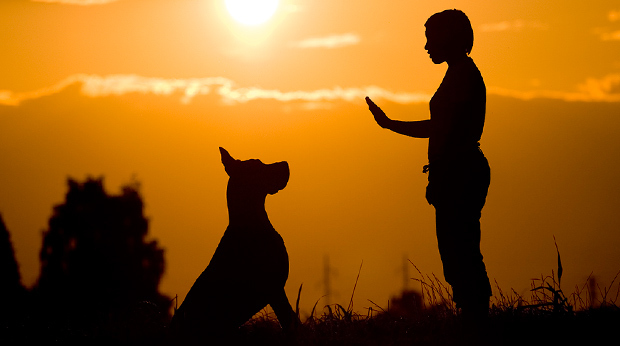 You’ll realize just how much you “talk” with your body without realizing it… and how to use your movements and body position to get the response you want from your dog. It’ll be a lot less confusing for them.